During Festive Season, Hoaweve's All-Brand Honor launched its new Smartphone Honor 8X in the Indian market. Remember that the Honor 8X smartphone was launched in China last month with Honor 8X Max. Apart from this, it is the upgrade of the company's popular Honor 7X. 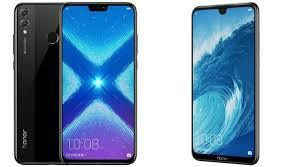 Talk about the important features of Honor 8X, the phone has a display niche like the iPhone X. Smartphones have features with Artificial Intelligence. Users will get features such as AR Stickers, Portrait Mode, HDR, and Super Night Scene. Price and availability of Honor 8XThe price of Honor 8X starts at Rs 14,999. This price will be sold to Variants with 4 GB RAM and 64 GB of storage. There are two more variants of Honor 8X - 6 GB RAM / 64 GB storage and 6 GB RAM / 128 GB storage, and their prices are Rs 16,999 and Rs 18,999, respectively. The sale of the phone will be on e-commerce site Amazon India and the company's own website from October 24. Honor 8X specificationThe Dual-SIM (Nano) Honor runs on Android 8.1 Oreo-based on the 8x EMUI 8.2.0. Honor 8X has 6.5 inch full HD + (1080x2340 pixels) TFT IPS display. Its aspect ratio is 18.7: 9. For Speed and Multitasking, the Honor 8X has given options of 4 GB and 6 GB RAM with Highcilicon Kirin 710 processor. There are two storage options - 64 GB and 128 GB As we have told you earlier, Honor 8X will have three variants based on RAM and storage - 4 GB RAM / 64 GB storage, 6 GB RAM / 64GB storage, and 6 GB RAM / 128GB storage. Now talk camera setup. Dual camera setup will be available on the back side, with the primary sensor of 20 megapixels and secondary sensor of 2 megapixels. The dead body of the rear camera is F / 1.8. There is also an LED flash on the back panel for better picture quality. A 16-megapixel front camera will be available for selfie and video calling. The front camera's revelation is F / 2.0. For connectivity WiFi 802.11 A / B / G / N / AC, Bluetooth version 4.2, GPS / A-GPS, Micro-USB and 3.5mm headphone jack will be available for connectivity. There is a 3,750 mAh battery for power backup. Honor 8X length-width is 160.4x76.6x7.8 millimeters.